Bulk file processing tool is an easy to use file processor that allows to carry out customized repeated operations on multiple files easily. With this tool, you can instruct the tool to process files in entire directories and subdirectories at once with a powerful preview and with multiple tools. It was designed to be easy to use yet powerful enough to handle some of the most complex repeatable tasks. 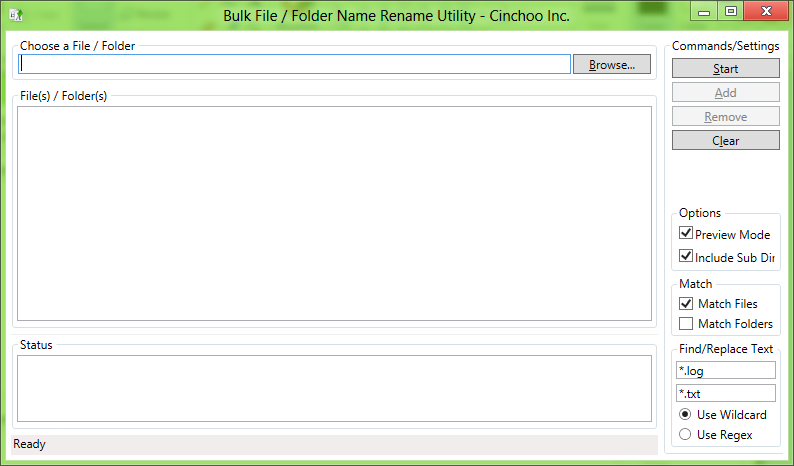 The very basic functionality it provides is that it allows to rename file names in batch. Moreover, you can craft file operations by extending this tool to carry out complex file operations like folder cleanup, file content search, rename photos with EXIF metadata, rename MP3 file using ID3 tags, etc. 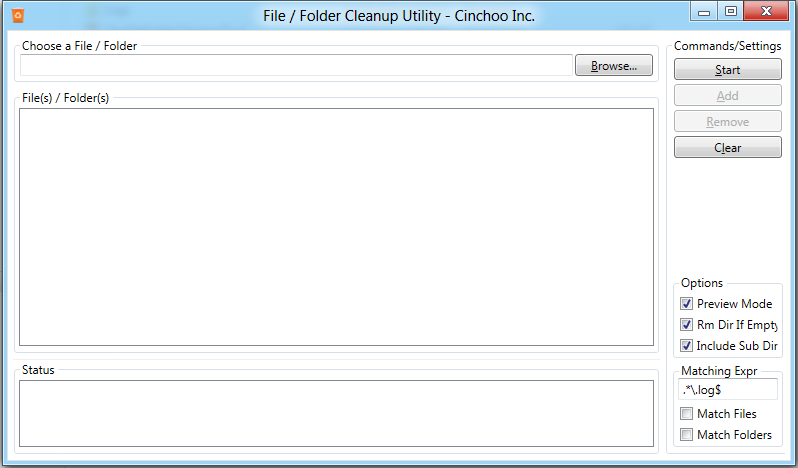 This tool is developed using Cinchoo – An application framework for .NET. It is the working example of using some of the key features of Cinchoo framework. 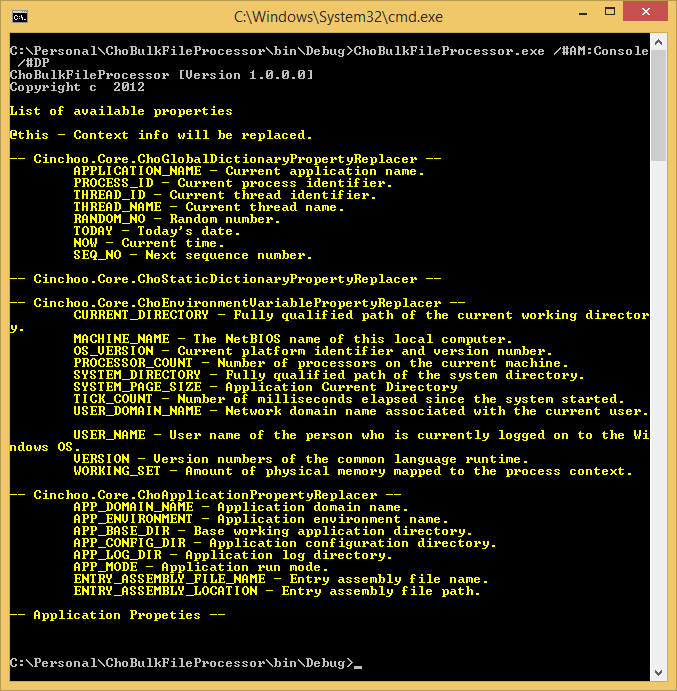 By default, if you run the executable (ChoBulkFileProcessor.exe), this will start as Windows application. In here, you can compose file operations, save them to profile (.blk file) file and run them. The main window looks like below. Main application toolbar contains a set of application command buttons that gives users quick access to do compose, open, save profiles and control the execution of file operations. – Create new profile settings file. – Open a existing profile settings file. – Save the profile settings to file. – Save the profile settings to new file. – Add folder to ‘Folders’ list for bulk processing. – Remove folder from ‘Folders’ list. – Start the bulk file processing. – Stop the bulk file processing. – Erase the status messages. – Undo the bulk file processing operations. Highlighted in Red area shows the name of the profile settings file. This section of controls allows to choose set of folders needed for bulk file operations. Input folder – Choose the input folder from button from the toolbar. This is the folder chosen for bulk file processing. Move/Copy to Folder – A destination folder where all the files will be moved or copied after bulk file processing performed. Optional. If blank, the files are processed and kept in the source location. Plug-ins folder – Optional folder where the custom plug-in assemblies can be loaded from. Later, I will discuss more in detail about plug-ins. This status window shows the status messages of the bulk file process. These are settings used to control the bulk file operations of this tool. Move – Choosing this option will move the files to destination folder after bulk file processing. Copy – Choosing this option will copy the files to destination folder after bulk file processing. Preview Mode – Turning this option will preview the bulk file operations. Recursive – Include sub directories for the bulk file operations. Overwrite – Option will overwrite the file if exists in the destination folder. Resolve Collision – When two files end up with same file names, this option will append incrementing number to the file name. Otherwise, the bulk operation will fail. 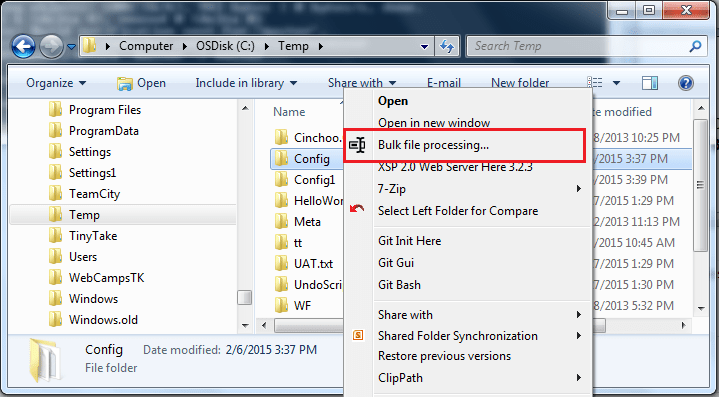 Files – Turning this option will perform the bulk operations on files only. Folders – Turning this option will perform the bulk operations on folders only. These options are primarily used to find and replace file names with specified expressions. Use WildCard – Option specifies that the expressions given in ‘Find Text’ and ‘Replace Text’ fields are wildcard patterns. Use Regex – Option specifies that the expressions given in ‘Find Text’ and ‘Replace Text’ fields are regular expression patterns. – Opens Regular Expression language – Quick Reference guide in browser. – If an error occurred when opening PlugIn Editor window, and wanted to reset the plug-in definitions due to corrupt definition stored in the profile settings file, you can do so by right-clicking on the ‘Advanced’ button to bring up popup menu and click on ‘Reset’ button. Sometimes, you may want to keep this tool running all the time and quickly go back to get access to this tool to carry out bulk file operations. In such cases, you can let them run in tray mode. By pressing ‘minimize’ button, the tool will be made to run in tray mode. After minimizing the main window, the tool will run as system tray. The below image shows the tool in system tray. In this mode, the below features are available to you. These will be available when you right click on this tool application icon in tray taskbar. 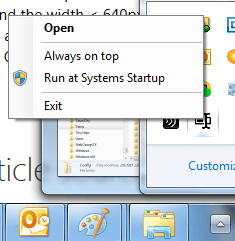 Run at System Startup – This option lets the application start up automatically when system starts. The below image shows the system tray context menu of this tool. test.blk – Profile Settings file path, either absolute or relative file path. /d – List of input folders for bulk file processing separated by ‘;’. To get help of the application, pass /? in command line. /d                      Source directories (separated by ;). Below is screenshot of help. This tool registers and associates .blk (profile settings file extension) files when you run this tool in elevated rights. 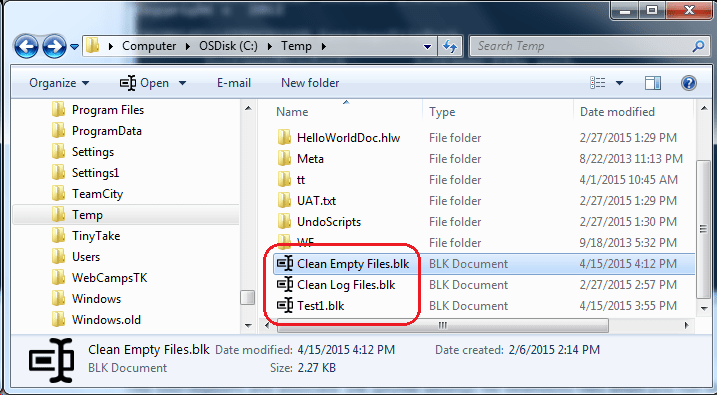 Once registration is successful, you can open .blk files from explorer directly by double-clicking the file. The below screenshot shows the .blk file associations. This tool registers and associates to all folders when you run this tool in elevated rights. Once registration is successful, you can right-click on any folder in explorer and launch this tool by clicking ‘Bulk file processing…’ menu. The below Screenshot shows the shortcut menu associations on folders. In this section, let me present some samples about renaming file names using simple and complex expressions. This will give you a quick start on how to use this tool. To rename files having extension .log to .txt extension, specify the below values to the tool. You can add date/time to file name either as prefix or postfix. The below sample shows how to prefix date to file names. ‘ReplaceText‘ expression above illustrates about prefixing today’s date to filenames. All expressions are surrounded by ‘%%’ delimiters. In this sample, we have specified ‘NOW‘ property to get today’s date. And specified format specifier ‘ddMMyy‘. Note that the property and format are separated by ‘^’ character. For a list of the available properties, please visit ‘Available Properties‘ Section at the bottom of the article. This section reveals the way to change the cases of files name either upper or lower case. In order to convert the name of the file name to upper case, you can use .NET string method ToUpper() in the ‘TransText‘ field as below. This section talks about adding automatic sequence numbers to the file names. Cinchoo framework provides ‘SEQ_NO‘ property to get the next sequence number. The below sample shows how to post fix auto sequence number to the file name. The example below shows how to skip by 3 and set the next sequence number to the file name. Here, we use expression to skip by number 3. Since ‘*’ is a valid wildcard character, in order to use this character as multiplication purpose, we have to escape that character by repeating it (‘**’). In this section, I’ll detail about using .NET string instance methods to perform some file name transformation. Only String class instance methods can be used. The sample below shows you how to change the file names to UpperCase. Cinchoo framework offers predefined set of properties to use. You can find them by passing the below command line arguments to executable. @this - Context info will be replaced. APPLICATION_NAME - Current application name. PROCESS_ID - Current process identifier. THREAD_ID - Current thread identifier. THREAD_NAME - Current thread name. SEQ_NO - Next sequence number. CURRENT_DIRECTORY - Fully qualified path of the current working directory. MACHINE_NAME - The NetBIOS name of this local computer. OS_VERSION - Current platform identifier and version number. PROCESSOR_COUNT - Number of processors on the current machine. SYSTEM_DIRECTORY - Fully qualified path of the system directory. TICK_COUNT - Number of milliseconds elapsed since the system started. USER_DOMAIN_NAME - Network domain name associated with the current user. USER_NAME - User name of the person who is currently logged on to the Windows OS. VERSION - Version numbers of the common language runtime. WORKING_SET - Amount of physical memory mapped to the process context. APP_DOMAIN_NAME - Application domain name. APP_ENVIRONMENT - Application environment name. APP_BASE_DIR - Base working application directory. APP_CONFIG_DIR - Application configuration directory. APP_LOG_DIR - Application log directory. APP_MODE - Application run mode. ENTRY_ASSEMBLY_FILE_NAME - Entry assembly file name. ENTRY_ASSEMBLY_LOCATION - Entry assembly file path. RoboCopy is a powerful tool included in the Microsoft Windows Server that is used to perform more advanced file replication tasks. The biggest benefit you’ll find is the ability to create full mirror duplicates of two file structures (including all subdirectories and files, if you choose). RoboCopy also allows you to preserve all of the associated file information, including date and time stamps, security access control lists (ACLs) and more which is missing from normal file copy operations. For people who like to work with command line, RoboCopy.exe tool as it is comes with package is great enough for them. However for those who are comfortable to work with GUI, here it is EazyCopy, a simple and intuitive GUI tool to RoboCopy command. 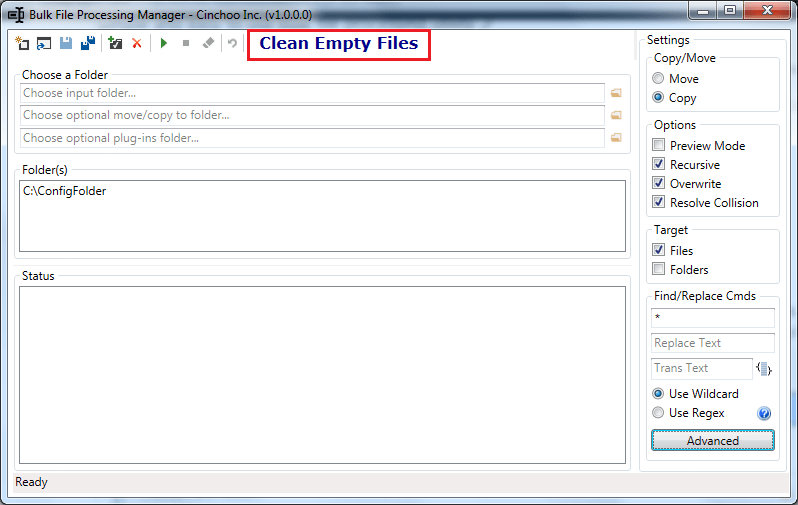 This tool is developed using Cinchoo – An application framework for .NET. It is another working example of using some of the key features of Cinchoo framework. – Start the RoboCopy processing. – Stop the RoboCopy processing. This section of controls allows to choose the folders needed for RoboCopy operations. This output window shows the output messages of the RoboCopy operation. It is a property grid window to visually edit and manage RoboCopy command line options group together by category. AdditionalParams – Any additional parameters not listed in the property grid you may want to pass to RoboCopy, you can specify here. Files – The files to be copied from source to target location. Wildcard accepted. RoboCopyFilePath – If the RoboCopy is not in the PATH, you can specify the exact location of the RoboCopy executable here. >ChoEazyCopy.exe /#AM:Console test.ezy /s:"C:\Test1" /d:"C:\Test2"
test.ezy – Profile Settings file path, either absolute or relative file path. /s – Source directory. Optional. If not specified, it will be picked up from settings file. /d – Destination directory. Optional. If not specified, it will be picked up from settings file. Below is the screenshot of help. This tool registers and associates to all folders when you run this tool in elevated rights. Once registration is successful, you can right-click on any folder in explorer and launch this tool by clicking ‘Eazy copy…’ menu. The below screenshot shows the shortcut menu associations on folders. This command line tool to remove matching files and folders from disk. It is written in using C#/VS.NET 2010. You require .NET Framework in order to run this tool. You can download it from here. /P Turn on preview mode. /R Remove directory if empty. /DMF Don’t Match file names. /F File name matching regular expression. <default> Semicolon(;) seperated Files or Folders path. 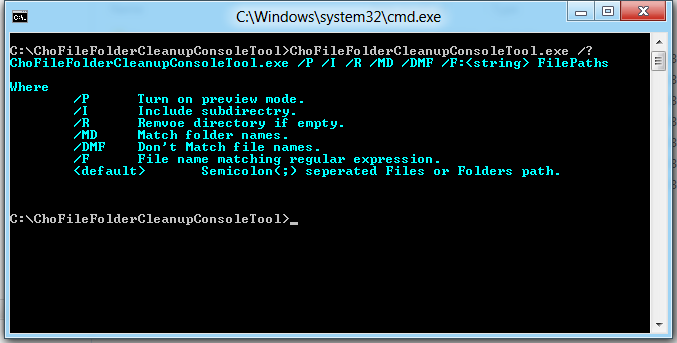 ChoFileFolderCleanupConsoleTool.exe  /DMF /I /P  "C:\SampleFileOrFolder1,C:\SampleFileOrFolder2"
This tool helps to remove matching files and folders from disk. It was written in using WPF/C#/VS.NET 2010. Click ‘Start’ whenever you are ready to clean up files. Any time you can can start this cleanup process. Type a full path of the file or folder in ‘Choose a File / Folder’ text box, then click ‘Add’ button to add it to ‘File(s) / Folder(s)’ list box. Or you can click ‘Browse’ button, to choose the file/folder for cleanup. Check ‘Match Files’ or ‘Match Folders’ check boxes, in order to include them for cleanup process respectively. Check ‘Preview Mode’ option, if you just want to see the files and folders are cleaned in the ‘Status’ box or in the log file under ‘Logs’ folder. This option will not delete files or folders. Check ‘Rm Dir If Empty’ option, if you want to remove empty directory during this process. Check ‘Include Sub Dir’ option, to include all sub directories for clean up process. In ‘Status’ box, you can view the statues of the file conversion. This command line tool converts tab characters to space characters and vice verse in text files. It is written in using C#/VS.NET 2010. /SI Turn on Spaces to TABS, otherwise converts TABS to Spaces. /FX Comma seperated file extensions. /N TAB size in spaces. 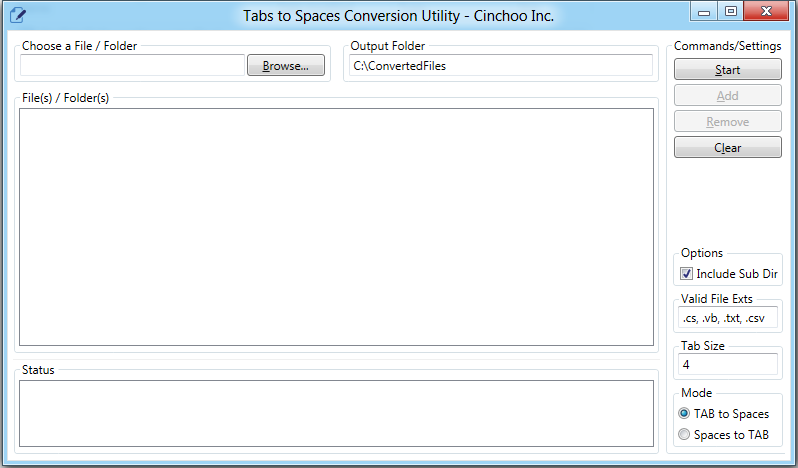 This tool converts tab characters to space characters and vice verse in text files. It is written in using WPF/C#/VS.NET 2010. Click ‘Start’ whenever you are ready to convert files. Any time you can can start this conversion process. Type a full path of the file or folder in ‘Choose a File / Folder’ text box, then click ‘Add’ button to add it to ‘File(s) / Folder(s)’ list box. Or you can click ‘Browse’ button, to choose the file for conversion. Type a output folder name in ‘Output Folder’ text box. This is where all the converted files will be written. If the folder not exists, will be created automatically. In ‘Valid File Exts’ text box, you can specify the type of files to be considered for conversion. Multiple file extensions can be specified in comma separated format. 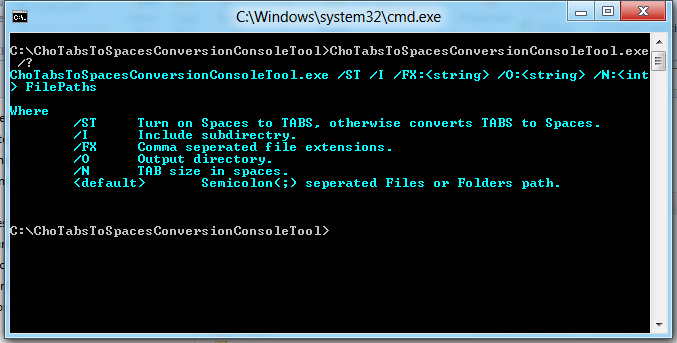 Choose mode either ‘TAB to spaces’ or ‘Spaces to TAB’ to convert files in respective way. Specify ‘Tab Size’ in the range of 1-60, amount of spaces for a TAB character. You can drag and drop file(s) or folder(s) to this tool for easy conversion process.